Humorous gift for both newlyweds and couples that have been together forever! 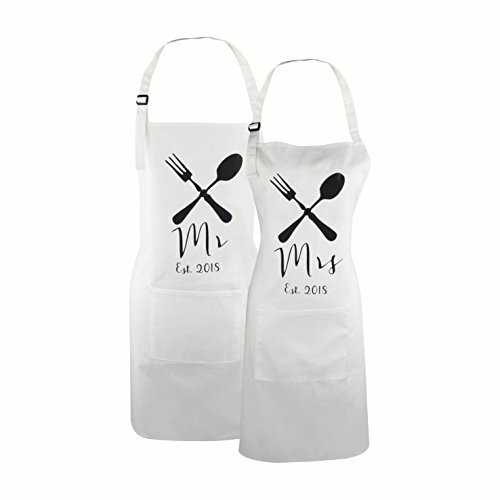 Our classic, bib-front aprons are the perfect gift for the bride and groom - for engagement, bridal shower, wedding or even anniversary. Our easy care 50/50 cotton and polyester blend aprons are screenprinted with Mr. Right and Mrs. Always Right on the bib. With adjustable neck straps, ample ties and a generous 32 x 25 ( length x width) sizing, our aprons fit most. A classy way to keep your outfit clean at the rehearsal dinner or reception. Professionally screenprinted. This charming set of couples aprons is sure to inspire a little love, fun, and enjoyment to accompany every meal. There's nothing like rolling up your sleeves in the kitchen and creating a delicious dinner with your new spouse. It helps build strong bonds, allows you to be creative together, and inspires you to do even more with one another. 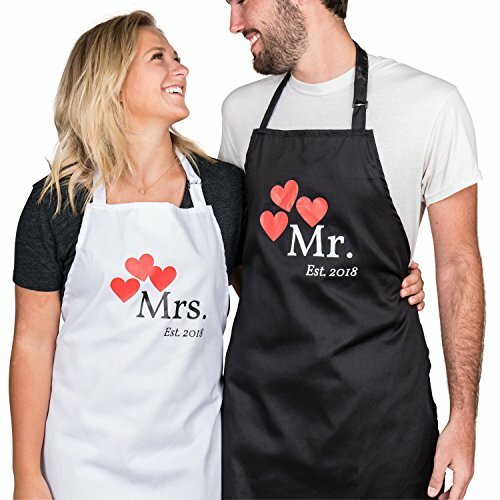 That's why we've created the Kitsch n' Charm Mr. and Mrs. 2017 Couples Kitchen Aprons a 2-piece bib set that lets couples get a little bit messy in the kitchen while they're learning and growing together. Durable, Adjustable and Ready for the Cookbook The cotton/polyester blend makes these bib-front aprons more comfortable and durable when it comes to preparing food. What's more, they're machine washable, so you never have to worry about keeping odors or dried around for very long! Product Details:Two (2) Kitchen Aprons Black with Pink Heart (Mr.) White with Red Heart (Mrs.) Fully Adjustable Cotton/Polyester Blend Machine Washable Adult Size: 27" x 22" (Ea.) 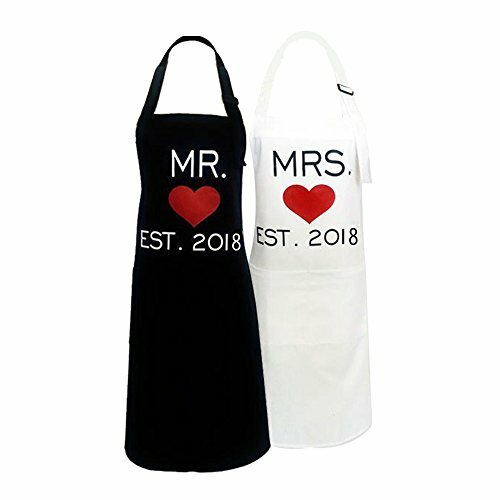 Satisfaction Guaranteed Click 'Add to Cart' to get these adorable couples apron set perfect for newlyweds or married people who left getting in the kitchen and making delicious food together. 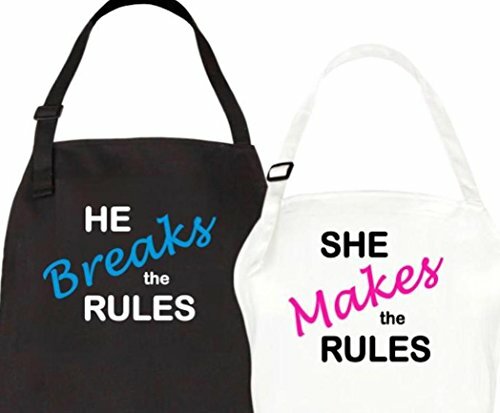 Our His and Her 2018 couples kitchen aprons are made of a quality, durable fabric. Quality is guaranteed. Our aprons will last long and don't shrink in the wash. They are also stain and wrinkle resistant. Great for outdoor, or indoor cooking, to protect your clothing while you grill or bake. 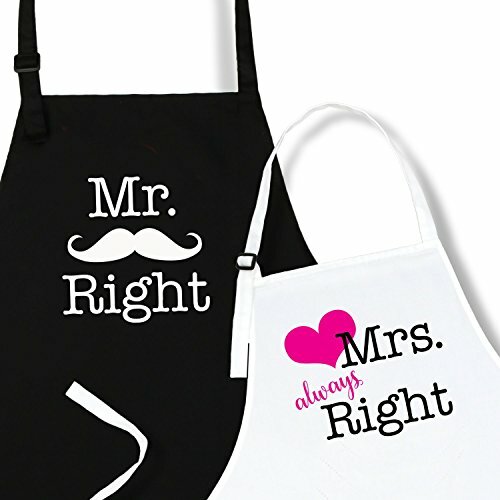 Mr and Mrs Aprons are great gift ideas for wedding marriage newlyweds, engagement, anniversary, or soon to be. 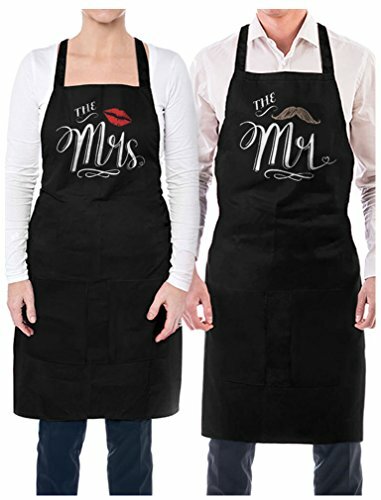 Funny Cooking Bibs are great for bridal showers, they come in black & white - His and Hers Set - 31 x 26 inches - ， Won't be short for Men, Perfect gift for the bride and groom. The perfect gift idea for newlywed couple, Gift for married couples. Fun present for Valentine's day / Anniversary. Great gift idea for couples that cook together. 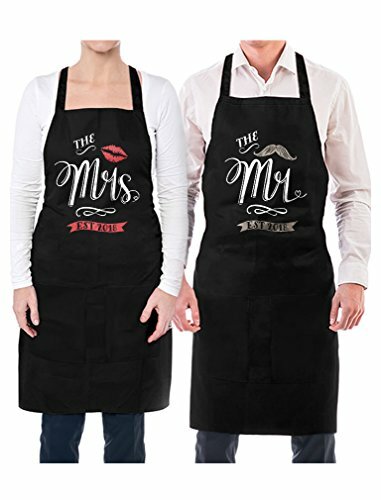 Mr. & Mrs. matching BBQ / cooking Apron set. The Bayside Deluxe apron that every home should have. Our Stay Clean Bib styled apron is ideal for use when handling foods or pharmaceuticals, and is made from a blend of polyester and cotton. An apron will keep foods from splashing on your clothes preventing unwanted stains. This Heavy Duty apron has a great classic look and is designed for men or women, You can rely on this apron for comfort ,durability and value for money. PERFECT PERSONAL GIFT - This 2-piece set makes the ideal wedding reception, anniversary, or birthday gift for couples who enjoy spending time in the kitchen.Mr & Mrs Heart-shaped ring dish in gift box.You can forget about having to wrap your special gift. The product comes in a special, elegant gift box, ready to be delivered to the final recipients, thus saving you the money and time! This charming set of couples aprons is sure to inspire a little love, fun, and enjoyment to accompany every meal. There's nothing like rolling up your sleeves in the kitchen and creating a delicious dinner with your new spouse. It helps build strong bonds, allows you to be creative together, and inspires you to do even more with one another. 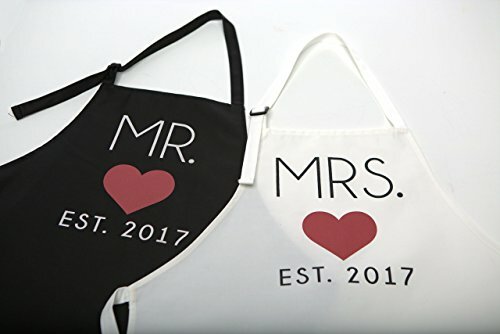 That's why we've created the Kitsch n' Charm Mr. and Mrs. 2018 Couples Kitchen Aprons a 2-piece bib set that lets couples get a little bit messy in the kitchen while they're learning and growing together. Product Details: Two (2) Kitchen Aprons Black with Pink Heart (Mr.) White with Red Heart (Mrs.) Mr & Mrs Heart-Shaped Ring Dish A special elegant gift box Click 'Add to Cart' to get these adorable couples apron set perfect for newlyweds or married people who left getting in the kitchen and making delicious food together. Fun couples gift idea! 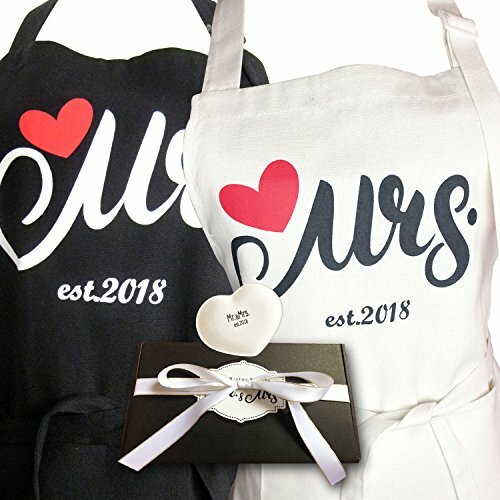 These matching apron sets are wonderful gifts for an engagement or anniversary party and also make thoughtful wedding or bridal shower gifts. Looking for more Wedding Apron similar ideas? Try to explore these searches: Plastic Bead Stretch Bracelet, Compact Outdoor Wall, and Mens Medium Hawaiian Shirt. Look at latest related video about Wedding Apron. Shopwizion.com is the smartest way for online shopping: compare prices of leading online shops for best deals around the web. Don't miss TOP Wedding Apron deals, updated daily.